The Lindsay Park Team of David and Ben Hayes and Tom Dabernig have high Spring Carnival hopes for the lightly raced European import Poetic Dream. Winx, above, heads up the betting for the 2018 Cox Plate at The Valley. Photo by Steve Hart. Poetic Dream has only started once on Australian soil for a fifth as the short priced favourite in the Group 3 $150,000 Autumn Handicap (1400m) at Flemington on March 3 during the 2018 Melbourne Autumn Carnival but co-trainer Tom Dabernig is willing to forget that run. “He potentially could be a real top horse for us, but is still a bit unknown,” Dabernig told AAP. “His trial at Werribee showed him up but then he disappointed at Flemington as he was in the perfect spot but didn’t quite do what we thought he could. Dabernig said that Poetic Dream’s Autumn Carnival campaign was cut short after the import injured his hock when he kicked out in the float but added that the import has spelled well. “The vets said we should give him a bit of a break,” Dabernig said. “We were lucky that we had that warm period in April and May so he actually got a good spell. Poetic Dream was a two time winner in Germany, his best run being a win in the Group 2 €153,000 German 2000 Guineas (1609m) at Cologne in Germany on May 21, 2017. Poetic Dream is included in the betting for the 2018 Group 1 $5m Ladbrokes Cox Plate (2040m) at The Valley in October at $51 with Ladbrokes.com.au. 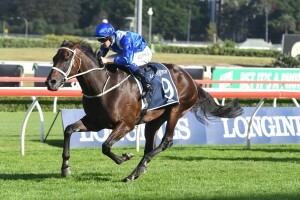 The Chris Waller trained super star Winx has been posted as the $1.55 favourite to win her fourth consecutive Cox Plate and if successful will be the first horse to achieve the feat. Early betting for the 2018 Cox Plate at Ladbrokes.com.au: $1.55 Winx, $15 Humidor, $21 Gailo Chop, Happy Clapper, Johannes Vermeer, Unforgotten, $26 Benbartl, Cracksman, D’Argento, Kementari, $31 Youngstar, $34 Ambitious, Egg Tart, Epoca D’Oro, Folkswood, Grunt, Harlem, Mendelssohn, Poet’s Word, Royal Symphony, Saxon Warrior, Thunder Snow, $41 or better the rest.